Hello and welcome to Day 174 of our year-long look at the Top 100 Hong Kong Movies of the Nineties, as voted upon by actual LoveHKFilm readers who had the time and the generosity to compile their lists of favorite nineties films and send them in. On our end, we compiled the results using five irritable monkees who live on the balcony of my apartment. I think they did a good job. “I can’t believe nobody has voted for my films! Today’s list covers numbers 30-21 of the Top 100. At this time I should thank the numerous readers who sent in their lists with comments added, as I can reprint them here to enhance the film blurbs AND spare myself a little time copywriting. You know who you are, and since your names get listed with your comments, now everybody else does too. Thanks a lot! Hit the jump to get started! 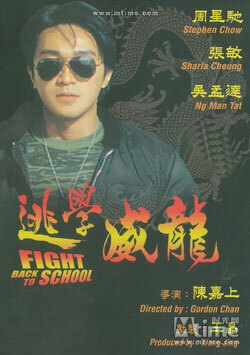 Stephen Chow rules the school in the first of the megahit FIGHT BACK TO SCHOOL movies. Basically a thinly-plotted excuse for Chow to put on a school uniform and show up lesser individuals — i.e. everybody not named Stephen Chow — this film helped cement the superstar status that Chow attained with his previous ALL FOR THE WINNER. 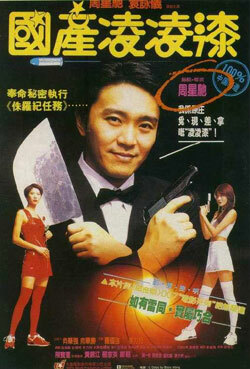 Co-starring a passel of regular Chow screen partners: Ng Man-Tat, Cheung Man and also Gabriel “Turtle” Wong. Remember him? Probably not. Once upon a time Hollywood optioned Peter Chan’s HE’S A WOMAN, SHE’S A MAN for a remake, but it hasn’t happened yet. Hopefully it won’t and someone will come to their senses and give this wonderful romantic comedy the DVD — nay, the Blu-ray remaster it so richly deserves. Anita Yuen charms up a storm in the role that earned her a second consecutive Best Actress Hong Kong Film Award, and Leslie Cheung and Carina Lau are perfectly cast as an appropriately glamourous superstar couple. 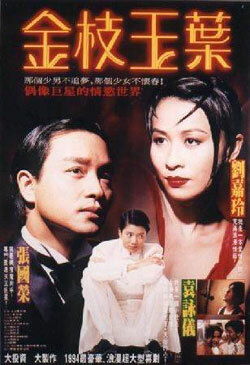 Featuring one of the classic Hong Kong Cinema theme songs, “Chase”, performed by Leslie Cheung. THE BLADE is what happens when someone makes ASHES OF TIME but decides to jam in as many themes as possible while cranking up the intensity and the action to a generous twelve. Not surprisingly, it’s Tsui Hark at the helm of this gritty-before-it-became-trendy swordplay classic. 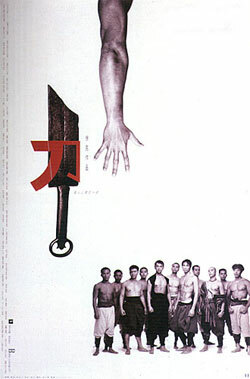 Grady Hendrix says that THE BLADE is “the omega of Tsui Hark’s period martial arts movies. 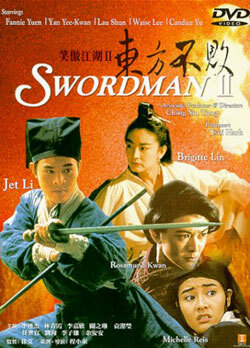 A retelling of ONE ARMED SWORDSMAN, it represented a new direction in action and story-telling that died a dog’s death at the HK box office. Fast and furious, it has never been equalled…nor has it ever been released on DVD with English subtitles.” Legally, that is. Valerie Soe says YOUNG AND DANGEROUS is good because “you can never get enough of Ekin Cheng in leather pants.” Depending on who you are, that’s certainly arguable, but the film’s impact on Hong Kong Cinema is not. This comic-based film launched its own subculture, not to mention a passel of imitators, a slew of sequels, a couple of spin-offs and a prequel. The film also propelled the actor who played the villain, some guy named Francis Ng, into the Hong Kong Cinema stratosphere. Some consider the sequels to be better. The best thing about FROM BEIJING WITH LOVE is the reveal — you know, the one where you find out that Stephen Chow’s Ling Ling Chat isn’t just a slow, dumb hick who likes knives. Instead, he’s a slow, dumb hick who is a GOD with knives. That he can’t use a gun is forgivable and only adds to this parody-filled laffer. A mixture of esoteric silliness, droll spy parodies and too-cool comic charisma, FROM BEIJING WITH LOVE also has Anita Yuen and a very funny Law Kar-Ying. Who didn’t catch the DAYS OF BEING WILD parody? Dark, operatic and erotically-charged, THE BRIDE WITH WHITE HAIR still enchants despite its early nineties MTV style. Leslie Cheung and Brigitte Lin play the doomed couple whose ill-fated love results in one of them — Lin, naturally — becoming a white-haired witch who can kill scores of enemies with just a withering gaze. 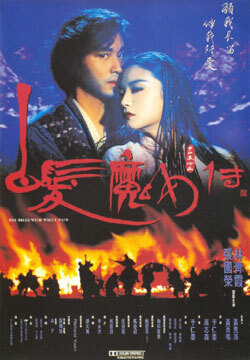 A turning point in HK film history for the wuxia genre and one of the key Hong Kong films of the nineties. It could have easily ranked higher than this. Site reader KL says about SWORDSMAN II, “Brigitte Lin’s turn as Asia the Invincible is sublime and perhaps the only reason to make this movie unforgettable. Um, Jet Li is in it, too.” Yeah, Jet Li is good in SWORDSMAN II, but his work pales next to the grand performance from Brigitte Lin as a man who wants so much to obtain ultimate kung-fu power that he’ll go the extra distance — that is, castrate himself and become a she! One could attempt this in real life as a way to move up the corporate ladder, but we’re guessing that it doesn’t work. What does work: this movie, both then and now. Probably one of the five movies every fan of Hong Kong Cinema has seen, SUPERCOP isn’t notable for the usual creative Jackie Chan choreography, but for its insane and unbelievable stuntwork, which likely sticks in the memory of anyone who’s seen it on the big screen. Also notable: the fact that Chan was willing to let himself be outshone by his co-star, action goddess Michelle Yeoh. SUPERCOP should rightfully live forever in the annals of action film history. If it doesn’t, then we weep for action film fans worldwide. Bonus points: it’s got a young Maggie Cheung! A MOMENT OF ROMANCE isn’t just popular, it’s legendary. Twenty years on, it still gets referenced in films and TV, and numerous people involved with the film — Andy Lau, Johnnie To and writer James Yuen among them — seem more than happy to parody it themselves. 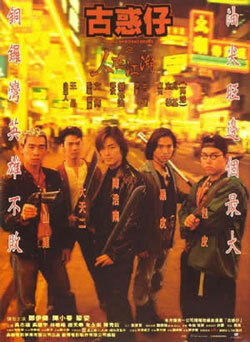 Also, Andy Lau’s Wah Dee character pretty much defined the righteous street triad archetype. Valerie Soe says its got “triads, melodrama, bloodshed, and Andy Lau, plus Wu Chien-Lien running down the street in a bloody wedding dress AND a bitchin’ theme by Beyond. Classic HK moviemaking.” We agree and so should you. Hey, we’re down to only 20 more films on this list! As usual, you’re free to speculate and wonder what’s left. The fact that SUPER ENERGETIC MAN or THE TRICKY MASTER have yet to appear augurs good things. 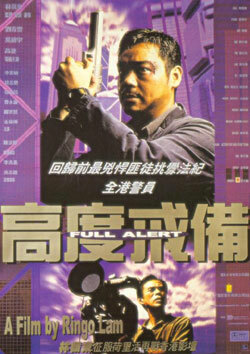 I’m also pulling for ANOTHER CHINESE COP, DANGEROUS DUTY, OPTION ZERO and other films starring Michael Wong. He was, after all, the biggest star of the nineties. Next time: Michael Wong! Maybe. 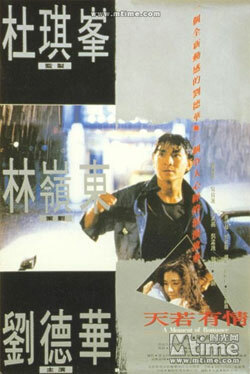 This entry was posted on Saturday, March 20th, 2010 at 7:42 am	and is filed under Reader Votes, Top Hong Kong Films of the 90s. You can follow any responses to this entry through the RSS 2.0 feed. You can leave a response, or trackback from your own site. Oh man, All these movies are great. I remember watch them more than once. My vote for YOUNG & DANGEROUS, SWORDMAN 2, POLICE STORY 3 and MOMMENT OF ROMANCE are out. So far, I have seen 74/80 movies and for my vote is 5/10. @b3n1: It’s me and Swordsman 2 this weekend! How could I have forgotten about Bride with White Hair?! The Blade was on my list, and……Y&D! Oh Yeah! I never saw Blade or Supercop (scratch head). Not sure if I ever saw Moment of Romance? So many movies to rewatch! Is that Wong Kar Wai in regular glasses? With this post, I’m more interested in which “five movies every fan of Hong Kong Cinema has seen”. @Ceefu. Oh…yeah, swordman 2 is much enjoyable than Casino Tycoon. So far, JET LEE movies in the 90’s are good except “The New Legend of Shaolin”. @qq. When did you start to watch HK films? Those movies are very popular in early to mid 90’s. Lots of publication and review of those movie in the magazine. Why does the DVD cover of Supercop says “Michelle Khan”?! First time I’ve seen all listed. Three more of the movies I voted for showed up. So far I’ve seen 65/80 and 6/20 that I voted for has been listed. I so love the 90s :(((!!! Why can’t they produce such good movies nowadays in HK??? I agree with Kozo, The Bride with White Hair MUST stand much higher, Top 3 or at least Top 5, I feel ashamed of not voting for this wonderful film with unforgetable Lin (my fav actress, ever) and Cheung. For Top 10, I guess Ah Sing will surely take three (God of Cookery, King of Comedy, A Chinese Odyssey), To will have two (Running out of Time, The Mission), Jet Li still has his Once Upon a Time II in pocket, that means we will miss A LOT of good movies in Top 100, because only 4 places are not enough for C’est la vie, mon chéri, Drunken Master II, Iron Monkey, Fong Sai Yuk, 4 Wong Kar-wai (Days of Being Wild, Ashes of Time, Chungking Express - my No. 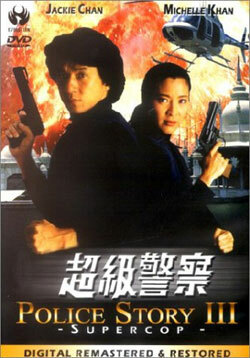 1 vote, Happy Together), 2 John Woo (Bullet in the Head, Hard Boiled). How I love the 90s :(! Oh, my dumb head, Kozo please delete my previous comment, just too overwhelmed by seeing so much good movies that I love and I forget that it’s only 30-21 :D! So we still have slot for good movies, I feel relieved. Hello all, really enjoying the list, I’ve been a regular reader of this site for a few years, though this is my first post. Just wanted to highlight that The Blade did receive an official English subtitled release here in the UK. The DVD was released by M.I.A. in their ‘Hong Kong Classics’ line. (Not sure wht other films they released, though I recall them releasing some HK films on VHS back in the 90’s). @Grenouille. Agree with you those movie you mentioned should be in TOP 20 minus Wong Kar Wai movies (Sorry, I’m not into his movies). Plus Jet Lee’s FIST OF LEGEND, Stephen Chow’s ALL FOR THE WINNER, Jackie Chan’s FIRST STRIKE and perhaps YOUNG & DANGEROUS 2. @b3n1 - I started watching HK movies during the ’80s when I was in elementary school (I’m located in Chicago and it was really my only connection to Chinese culture besides TVB). So I basically saw whatever was available at the Chinatown video store that my parents were willing to rent. ‘97-99 marked my last years of highschool and beginning of college so I think I didn’t watch that many movies - only had time for giant budget ones or Stephen Chow. Didn’t realize I was missing a huge chunk of the golden years. @Kamina888, as a recent obsessive follower of Hong Kong film, thanks for the tip, I’ve just rented it. Am I right in thinking that the UK does not serve Hong Kong film particularly well? Or is it just me not looking in the right places? @Kozo, love the blog and the list, looking forward to the final gallop to the post. @Helena, to answer your question could make an interesting blog post in its own right. Though it would need a fairly in depth knowledge of the UK film scene (and of course its history), and a site to post it to, neither of which I have. In my opinion for a country with a much smaller fan base than the US the UK has been fairly well served when it comes to HK and Far East Asian films. However with the economic crisis, as well as the demise of Tartan and Hong Legends, two of the most prolific licensors or Far East Asian films the amount of films released recently has reduced compared to couple of years ago. Though with the resurrection of Tartan (by Palisades), and new players like CineAsia, Metrodome, & Momentum there is hope for the future. @Helena to answer the second part of your query, if you have access to a rental service like lovefilm.com, you should be able to rent out of print dvd’s (like The Blade). This is how I saw films such as The Bride with White Hair, Green Snakes, Swordsman 1 + 2, Running out of time, Iron Monkey, etc. Whoa, a whole lot of people other than me voted for Full Alert, edging out even The Longest Nite. Dunno why, but that is one film that never comes up in 90s film conversation, and which is why I had assumed it would be overlooked. Now to be proven wrong again, and have Where A Good Man Goes place somewhere in what’s left of the list. Seen 5 of 10, voted for 2. So 13/36/80 - atleast six of my remaining seven picks are a shoo-in. Police Story 3 made the list!! WOOT WOOT!! One of my favorite Jackie Chan/Michelle Yeoh films of all time! Full Alert, Fight back to school and Swordsman 2 made the list! WOOT! Where can I at least get an illegal version of the Blade in the US? I keep hearing about it, but it’s like the got-damn bird in the Maltese Falcon! @Garvin. I voted for SUPERCOP instead of FIRST STRIKE and I like SUPERCOP than any other Jackie Chan movies in the 90’s. But, FIRST STRIKE was Jackie’s biggest box office movie in HK history so I believed there are many people who voted for this movie. I watched BLADE during christmas 1995 in cinema, I still remember it. The fighting is brutal and violence, but its good. “Brutal and Violence” that’s why I avoided The Blade by that time. But now I wanna watch it..!!! @kamina888, thanks for the tip on THE BLADE! Had heard of that version a while ago, but it slipped my mind when editing the comments. Sadly, I am sometimes blithely US-centric (just ask Canadians). @kamina888 - I did just that with The Bride with White Hair, and Lovefilm sent an absolutely unwatchable copy, such a shame, as I could see it was a beautiful film. For DVDS I search on ebay, France (much better served)and yesasia etc. But if you ever want to send me that story about HK film in the UK … please do ;-). @Helena, no need for apology. You’re using comments on this blog exactly as intended. The only thing I would probably censor heavily are personal attacks and advice on illegal download. In a slightly related note, whenever someone mentions LOVEFiLM, I feel the urge to explain that LoveHKFilm existed first. I once got an email insinuating that I had shamelessly ripped off the site name from LOVEFiLM, when in fact they were called DVDsOnTap when LoveHKFilm first showed up. Actually, I stole the site name from Ken Akamatsu’s amusing but overall quite mediocre manga LOVE HINA. Would love to see cleaner transfers of many of these films in 1080i or 1080p. Dragon Dynasty does a great job but would love to see Police Story III in 1080p.